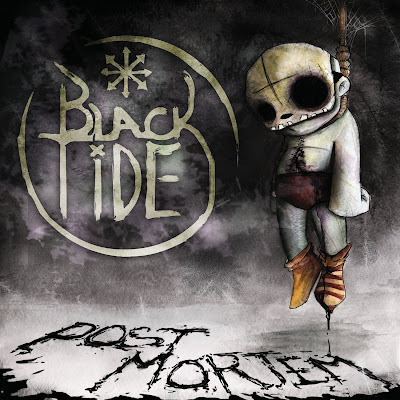 Discussions Magazine Music Blog: BLACK TIDE/Post Mortem: Available August 23rd, 2011! BLACK TIDE/Post Mortem: Available August 23rd, 2011! 2011 album from the Miami Metal quartet. On Post Mortem, the band has developed and deepened its sound, creating a collection of dangerously hypnotic hard rock. The new material showcases the band's creative expansion, and the members of Black Tide collectively worked on writing the album together over the past two years, honing their skills. First single, "That Fire" burns with an acoustic intro and a syncopated polythythmic groove while "Bury Me" breaks down with a mathematical madness as hard-hitting riffs crisscross and careen violently. Then there's "Ashes," which packs a pummeling punch, and "Walking Dead Man," a barn-burner of a track that Steven actually wrote on guitar.